On March 15, The American Legion will celebrate its 100th birthday. To highlight its centennial nationwide during the biggest New Year’s Day celebration, The American Legion will have a presence in the 130th annual Tournament of Roses Parade in Pasadena, Calif., Jan. 1. An American Legion centennial float will travel the 5 1/2-mile parade route filled with hundreds of thousands of spectators and millions of viewers watching live on television. 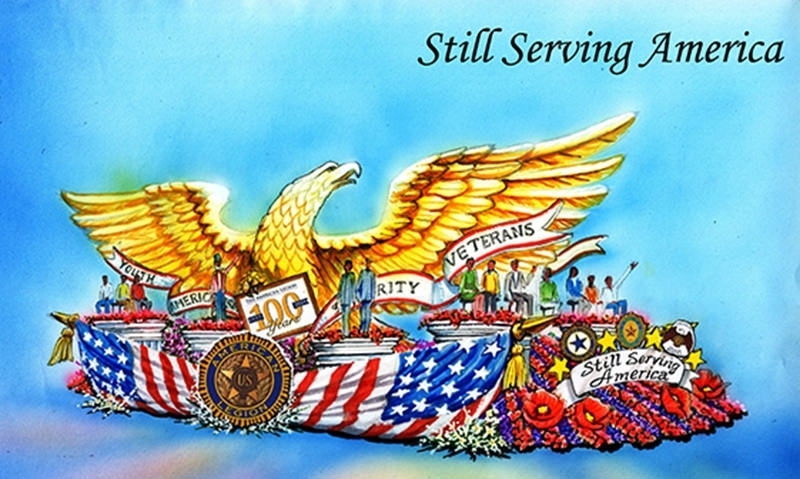 The float will showcase to parade viewers who The American Legion is with its representation. This includes several members of the Legion Family, such as National Commander Brett Reistad, Sons of The American Legion National Commander Greg “Doc” Gibbs and Auxiliary National President Kathy Dugan. Also included will be American Legion Riders, youth program alumni such as 2018 American Legion Boys Nation President Joshua Cheadle and Auxiliary Girls Nation President Hoda Abdalla, Samsung American Legion scholar Jack Gardner, and Olympic gold medalist and American Legion air-rifle champion Jamie Corkish. A representative from each of the five military branches also will be on the float, along with a Medal of Honor recipient from each of the war eras. They include Hershal “Woody” Williams of World War II, Ron Rosser of the Korean War, Walter “Joe” Marm of the Vietnam War and Britt Slabinski of the Global War on Terror. The Rose Parade will be broadcast live beginning at 8 a.m. PST. The parade is televised on ABC, NBC, Hallmark Channel and others. Check your local broadcast listings for more information or visit www.tournamentofroses.com.